During MSNBC's live coverage of Tuesday's West Virginia Democratic primary, Chris Matthews three times compared Hillary Clinton to Al Sharpton because she recently cited her popularity with white blue-collar voters as a reason she should be the Democratic presidential nominee. Matthews: "It's almost like she's the Al Sharpton of white people." Keith Olbermann claimed that media coverage of the Democratic campaign has been fair, but still conceded that "if the media leaned at any point early on in this race, it was not against [Clinton], but towards her." Matthews contended that, similar to the way Bill Clinton in 1992 had "a tremendous wind at his back in terms of press coverage because of generation," this time Barack Obama "has benefitted from being the new breeze." At about 6:09 p.m., Matthews jokingly made a prophesy about Hillary Clinton he would himself soon fulfill: "You know, I think if Hillary Clinton says the word 'white' one more time, she's going to be accused of being the Al Sharpton of white people." During an interview with Obama supporter and Democratic Senator Bob Casey, Matthews more seriously brought up his concerns about Hillary's talk about race, comparing her to Sharpton: "This conversation as it's turned, I mean, I even hate saying things like 'white working class voters,' you know. I was taught growing up, don't even say words like 'blue collar,' don't even get into that kind of elitist talk. ... How do we get back away from this where these people like Hillary Clinton so loosely say 'hard-working white workers' and, you know, it's almost like she's the Al Sharpton of white people." At about 8:13 p.m., during an interview with Mike Huckabee, Matthews seemed to cast aside his aversion to talking about racial politics as he asked what Obama has to do to "rebuild a diverse party." Matthews: "Doesn't he have to bring in real working guys, real labor-type white guys, if you will, to establish the fact that he's got connection with the working roots of the Democratic Party?" 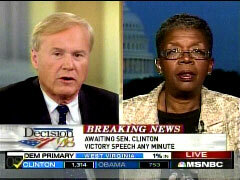 About 8:25 p.m., during an interview with Clinton supporter and Democratic Representative Stephanie Tubbs Jones, Matthews again brought up the Al Sharpton comparison: "I'm hearing her talk like a politician who's willing to talk in the language of politicians like Al Sharpton, who engaged in this kind of politics, group politics." At about 9:32 p.m., after Hillary Clinton's speech, Olbermann decided to defend media coverage of the Democratic candidates: "I would suggest that, in terms of the media coverage towards Senator Clinton, has not been anywhere what she has presented it back to us as. It has not been brutal. It has not been disenfranchising. ... I just can't imagine that we would be sitting here tonight if the numbers were reversed, and this was Senator Obama claiming this race continue. I can't imagine that we, I think we'd have cartoons on right now instead of what we're seeing." Bill Clinton came into the White House in 1992 and '91 with a tremendous wind at his back in terms of press coverage because of generation. A lot of the reporters were Bill Clinton's age. They had backgrounds like he did, coming from humble roots to going to better schools. They liked him. They thought he and Al Gore were the new breeze, and George H. Walker Bush seemed to be a bit out of it at that point. This time around, I think Barack Obama has benefitted from being the new breeze. Maybe that's a function of the media, to always bring in the new breeze, the new exciting new factor, to root for the underdog, if you will. Olbermann soon concluded: "And if the media leaned at any point early on in this race, it was not against her, but towards her." Just a few minutes later, McAuliffe, a member of the Clinton campaign, appeared for an interview, after having already appeared earlier when he had built up expectations of the night's Clinton speech. The former DNC chairman joked about Matthews's declaration last February that one of Obama's speeches caused a "thrill going up my leg." McAuliffe: "I'm sure it [Hillary's speech] sent shivers up Chris Matthews's leg." Laughing, Matthews admonished him: "You know, you keep going back to the golden oldies. How about some new material tonight, Terry?" CHRIS MATTHEWS: You know, I think if Hillary Clinton says the word "white" one more time, she's going to be accused of being the Al Sharpton of white people. MATTHEWS, INTERVIEWING SENATOR BOB CASEY (D-PA): What are your feelings, as a Democrat, about this whole discussion we've never had, you and I have never heard in our lifetime. I mean, we've known the ethnic and racial issues always get in the way of, you know, arguing over issues, real issues, but this conversation as it's turned, I mean, I even hate saying things like "white working class voters," you know. I was taught growing up, don't even say words like "blue collar," don't even get into that kind of elitist talk. We're not sociologists, we're Americans. How do we get back away from this where these people like Hillary Clinton so loosely say "hard-working white workers" and, you know, it's almost like she's the Al Sharpton of white people. I mean, how do you get away from that? MATTHEWS, TO MIKE HUCKABEE: How does, in the current situation of party-building, does Barack Obama have to rebuild a diverse party? Doesn't he have to bring in people like AFSCME president, international president Jerry McIntee? Doesn't he have to bring in real working guys, real labor-type white guys, if you will, to establish the fact that he's got connection with the working roots of the Democratic Party? MATTHEWS: Do you believe that Hillary Clinton was misquoted by the newspapers when she said, I think it was USA Today, that she said white working class, hard-working white workers, do you think she was misquoted? MATTHEWS, LAUGHING: Ha, we're writing her scripts now. I mean, come on, that's pushing it pretty hard. TUBBS JONES: No, I'm not, no, fact. The facts that you've been giving are the facts that she's taking. And so you have to agree with me on that, Chris. Correct? MATTHEWS: Well, she was quoting the Associated Press, but it was unusual for a politician to be caught using language which would cause a language problem. I mean, if she knew it was the wrong way to say it, why did she say it that way? TUBBS JONES: Well, see, I don't think that was her intention. All you have to do is look at her body of work, and her body of work shows that Hillary Clinton has supported the African-American community, has worked on issues that are important to the African-American community, has promoted the African-American community, and I find it strange that people now want to call her racist. Absolutely not. I don't buy it. MATTHEWS: No, no, let me just tell you, let me just tell you what I'm saying. I'm quoting her. And I'm hearing her talk like a politician who's willing to talk in the language of politicians like Al Sharpton, who engaged in this kind of politics, group politics. I find it unusual that she would do that. I do agree with you, there's no doubt she wished she hadn't done it in the way she did it, but she did. TUBBS JONES: And she was repeating what you and every other person that talks about the division of who's voting for who and where. She's only saying what you've said. It is fact. MATTHEWS: Well, you know what, that maybe, because I hate the phrase "white people." I find it weird. I think it's weird we talk like this. I think this country has been built on not talking like this, and here we are, in 2008, talking like this. TUBBS JONES: We talk about white people, we talk about black, brown, yellow people. It's a fact. MATTHEWS: I know. It ain't exactly progress. KEITH OLBERMANN: One last point before we go to Tim Russert. The Clinton supporters are fond of saying, and to be fair, many of the Obama supporters say this as well, that this is not nearly as bruising or divisive a fight within the Democratic Party that we've seen in the last six months as some of us have been wont to suggest. I would suggest that, in terms of the media coverage towards Senator Clinton, has not been anywhere what she has presented it back to us as. It has not been brutal. It has not been disenfranchising. MATTHEWS: It's fickle. It's fickle. OLBERMANN: It may have been fickle, but I just can't imagine that we would be sitting here tonight if the numbers were reversed, and this was Senator Obama claiming this race continue. I can't imagine that we, I think we'd have cartoons on right now instead of what we're seeing. MATTHEWS: I want to suggest something. This is maybe just, many ways to analyze press coverage. Their own press relations, the way they've handled the press, you could point to as one of the factors here. Bill Clinton came into the White House in 1992 and '91 with a tremendous wind at his back in terms of press coverage because of generation. A lot of the reporters were Bill Clinton's age. They had backgrounds like he did, coming from humble roots to going to better schools. They liked him. They thought he and Al Gore were the new breeze, and George H. Walker Bush seemed to be a bit out of it at that point. This time around, I think Barack Obama has benefitted from being the new breeze. Maybe that's a function of the media, to always bring in the new breeze, the new exciting new factor, to root for the underdog, if you will. But, by the way, if you want to make a Rocky comparison, she's Apollo Creed, by the way, not Rocky. She came into this bout as the favorite. And if this bout goes the distance, not necessarily a credit to Apollo Creed. 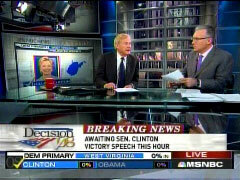 OLBERMANN: And if the media leaned at any point early on in this race, it was not against her, but towards her. OLBERMANN: Well, sir, you had described that [Hillary Clinton's speech] as one of the greatest speeches ever, warned us to anticipate that. Did it meet your expectations? 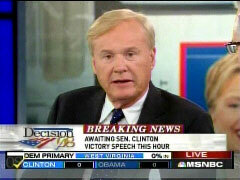 TERRY MCAULIFFE: It did, and I'm sure it sent shivers up Chris Matthews's leg. MATTHEWS: You know, you keep going back to the golden oldies. How about some new material tonight, Terry?